Clay for Grandparents Day craft? Why not? 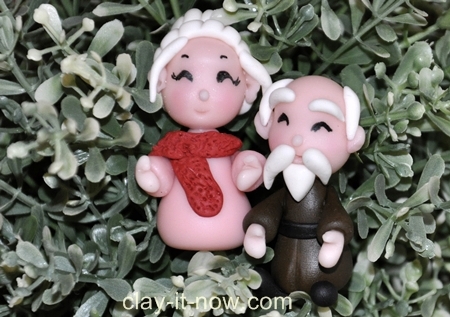 Create cute mini figurine of your grandparent and they will love it for sure. It's easy too! Your figurine will brighten up their life. So make your best gift for grandparents day. Air dry clay in black, white, brown, pink, red and skin color. 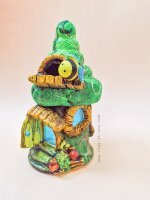 You can make your own clay with our modeling clay recipes or you can buy air dry polymer clay that will dry hard. DIY texture tool. Check my essential clay tools page if you have not seen it. Take your brown clay color and roll it to a cone shape, make a trouser line in front and back of the body and 2 small cone shapes for the sleeves. Roll two small egg shapes in black color, flatten the narrow end and slip in to the underneath of the body. With the same black clay, roll a small pipe, flatten it and wrap around the body. Roll your skin clay color to two small cone shapes, flatten it and cut to create a thumb. Attach this to the sleeve with white glue. Start with rolling the skin color clay to a ball shape, indent the middle of the ball with your finger, create a smile line, add nose and ears and draw the eyes and eye brows after the clay dry. Make a beard from white clay color. Roll small cone shape, flatten it and glue to the chin. Continue with rolling several small sausage shapes in white color for mustache, eye brows and side hairs. Glue them like the picture. Attach the head to the body when it's dry. Basically all the steps are the same with grandfather except that you use different color as you like. I chose pink clay color here. As for the shawl, roll pipe shape, flatten it and pierce with your DIY texture tools. After that, wrap it around the neck. The steps are the same as grandfather. The difference is the hair. Roll a ball shape white color clay, flatten it and cover the head with it. Make hair lines with your clay tools or used credit card if you don't have the tool. And then roll another ball shape and paste it on top of the hair. Roll two or three small sausage shape for fringe or hair in front of the face. That's it! You have just finished your grandparents day craft. Do you have idea for grandparents day craft activities. We would love to hear from you. Please submit your story and picture at this page.